Ancient Balinese legend describes a host of powerful spirits who help poor rice farmers achieve success. These farmers have long used a sophisticated irrigation system to organize rice cultivation by integrating religious devotion and social responsibility with traditional farming methods. Even modern farmers seek to placate the spirit world in their quest to produce and abundant harvest. In Spirits of the Rice Paddy players must compete with fellow rice farmers to construct and tend rice paddies. Oxen can build walls and remove large rocks. Ducks can be employed to eat harmful pests and fertilize the fledgling crops. Weeds must be kept at bay. And, most importantly, water must be conserved and released with the greatest of care. With a little luck, all that back-breaking labor will pay off in the end. The good news is that the spirits are eager to assist, granting many special abilities, blessings and magic. The farmer who produces the most rice over seven rounds wins the game. 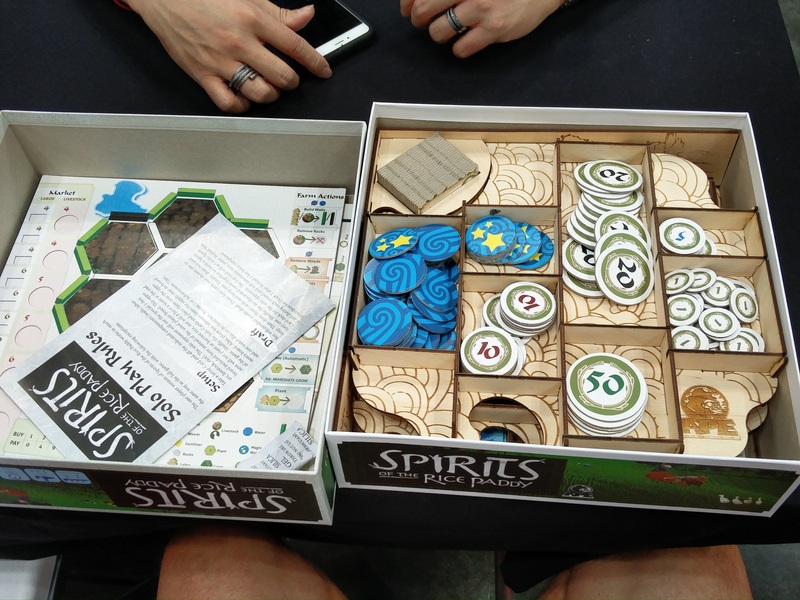 Reviewer Richard Ham gives his impressions of Spirits of the Rice Paddy after playing a pre-production copy. ...a wonderful, perfect farming simulation! A very interesting and intricate puzzle! Philip duBarry is the designer of Revolution!, Courtier, and several other board games and expansions. Philip has been playing and creating games since childhood and has done so on a professional basis for about the last six years. 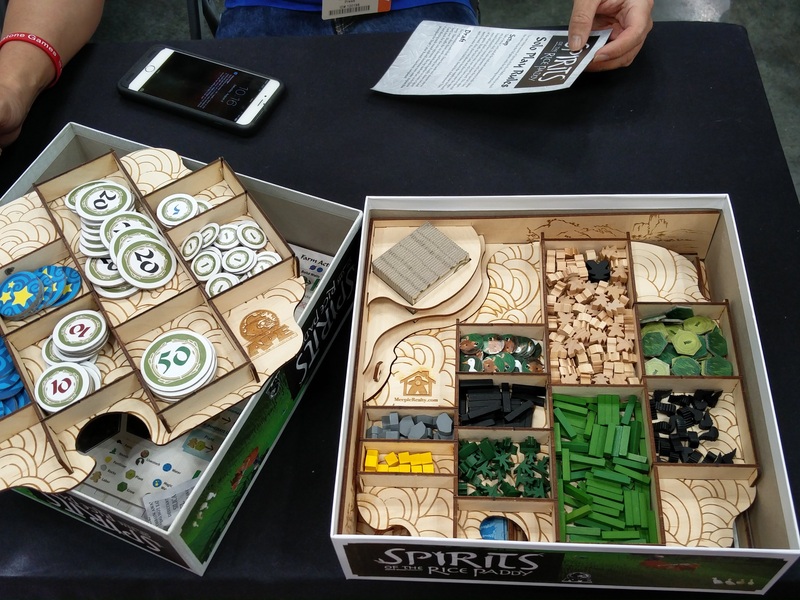 Spirits has been in the works since 2010 and is perhaps his most heavily playtested game to date. He lives in Cincinnati with his wife and six children. 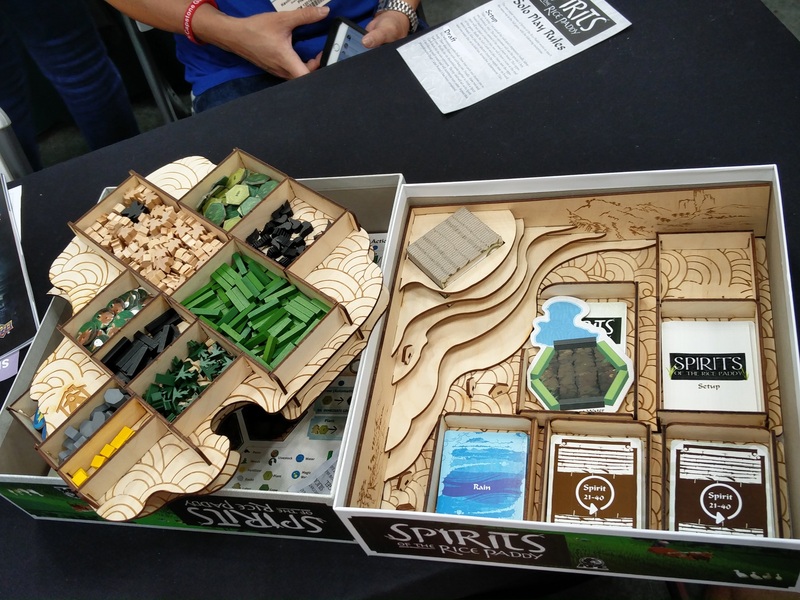 Spirits can be played by 2-4 players, ages 13+. It can be played in about 90 minutes. Buy the game from APE Games and get special cards and a board to play the game solo! includes free solo componentsBuy Spirits of the Rice Paddy from APE Games and get the exclusive solo play cards and board (not available in stores) at no extra cost!